Both the SUVs are likely to be showcased at the 2020 Auto Expo in February. Both will compete in the same segment; will rival the likes of the Hyundai Creta, Kia SP2i, Nissan Kicks and Renault Duster. Kamiq is expected to launch first, in the second half of 2020, followed by the T-Cross. Both the SUVs share the same platform and powertrains, but are completely different in terms of styling. Volkswagen Group’s next set of localised, made-in-India products will be compact SUVs from its two mainstream brands: VW and Skoda. Christened the VW T-Cross and Skoda Kamiq, these SUVs are global models and will be launched in India too. Both the SUVs are based on VW Group’s MQB A0 platform (pictured below), which will be localised in India. Without further ado, let's take a look at their international spec sheets to give you a fair idea of what to expect. 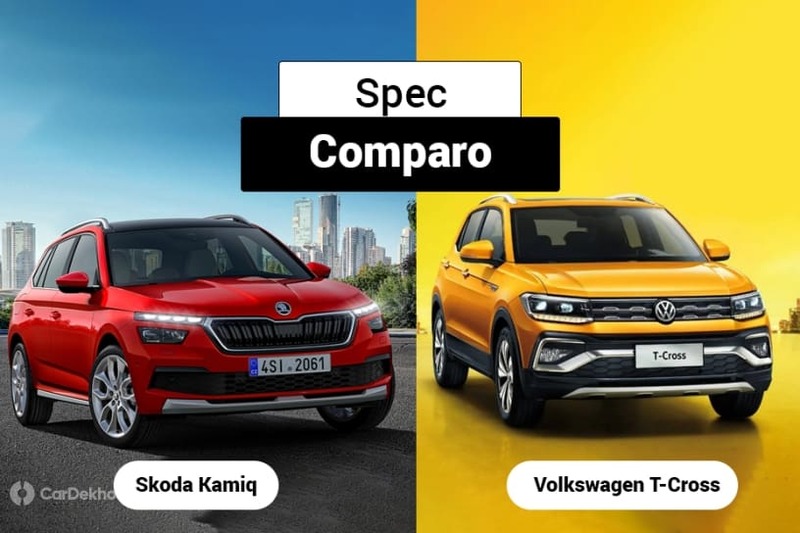 Dimensionally, there are two versions of the T-Cross – Euro-spec (2,563mm wheelbase) and Brazil-/China-spec (2,651mm wheelbase) – unlike the Skoda Kamiq (2,651mm wheelbase). Of the two, India is expected to get the T-Cross with the larger wheelbase, so we’ll compare the Brazil-spec T-Cross and the recently revealed Kamiq. Underpinned by the same MQB A0 platform, both the SUVs have an identical wheelbase. But the Kamiq is slightly longer than the T-Cross. The T-Cross, on the other hand, is marginally taller. Irrespective of these minor differences, both SUVs should have a comparable road presence. Since both the cars are positioned similarly, we don't expect there to be a drastic difference in terms of features. Here's what's on offer globally. Lights: Both SUVs offer full-LED headlamps and tail lamps with LED elements. The Skoda, however, comes with a split setup at the front and also features dynamic turn indicators. Wheels: Both SUVs offer upto 18-inch wheels globally. The India-spec models are expected to get 17-inch alloys, just like other cars in the segment. Infotainment system and instrument cluster: While the Kamiq can be had with upto 9.2-inch touchscreen infotainment displays, the T-Cross is available with upto 8-inch units. The India-spec SUVs are expected to get an 8-inch system in their range-topping variants. Both the SUVs feature a 10.25-inch fully digital instrument cluster and the India-spec model should get that too. The digital instrument cluster also displays full-screen navigation maps. Comfort features: Both SUVs have nearly the same set of features. Some of the highlights expected on the India-spec models are sunroof, dual-zone climate control and wireless Qi charging. Boot space: The Kamiq has a 400-litre boot which can be expanded to 1395 litres with the rear seats folded down. The VW T-Cross, on the other hand, features variable boot space, thanks to the sliding second-row seats. Depending on the position of the second row, the boot space of the T-Cross varies between 373 and 420 litres. Moreover, like the Kamiq, the rear seats also fold flat to expand the space further. Safety features: The India-spec SUVs are expected to pack multiple airbags, electronic stability control (ESC), hill hold control, tyre pressure monitoring system and fatigue detector. Features like dual front airbags, ABS and reverse parking sensors will be standard. So far, Volkswagen Group has confirmed that its MQB A0-based cars will be powered by an all-new, locally manufactured 1.0-litre TSI turbocharged petrol. Available in two states of tune (95PS and 115PS), these SUVs are expected to get only the more powerful version. The 1.0-litre turbocharged engine is also available with a CNG fuel option overseas, which VW might consider for India too. There’s no clarity on the diesel engine for India as Volkswagen is rumoured to ditch its 1.5-litre TDI engine once BSVI emission norms are implemented in April 2020. The Euro-spec SUVs, however, get the option of a 1.6-litre TDI engine. Both the Kamiq and T-Cross will be launched in India in 2020-21. Both are expected to feature minor cosmetic changes for the Indian market and might look more rugged. The Kamiq is expected to launch first, around Diwali 2020, followed by the T-Cross. Both SUVs will compete in the compact SUV space and will rival the likes of the Hyundai Creta, Kia’s upcoming SP2i SUV, Nissan Kicks, Renault Duster and Captur.